The traditional occupation of the Kasar or Tambat people is the production and sale of copper and brass items. Tambat in Marathi means copper. Some Kasar claim Kshatriya level, the second highest caste in Hinduism. In some areas they are seen as merchants, workers or even Dalits. 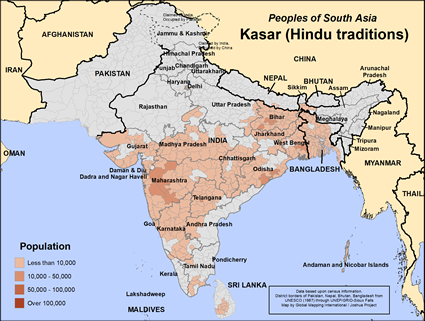 Originally, all Kasar were Hindus. Some Kasar converted to Islam during the time of the Moguls. 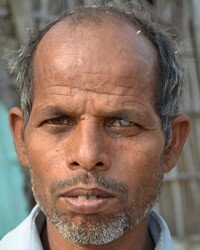 Most of the Kasar people live in India, though a smaller number live in Bangladesh and Sri Lanka. The Bangladeshi Kasar mostly reside in the states of Dhaka and Rangpur. The primary language of the Bangladeshi Kasar is Bengali. The economic position of the Kasar varies widely. Some are wealthy factory owners. These factories used modern machinery to make metal vessels, Hindu idols, utensils, bangles (rigid bracelets) and musical instruments. Other Kasar shape metals items like their ancestors did using ancient techniques. One of their specialties is using a hard form of brass called bell metal. They shape bell metal into polished bells and cymbals. The price of copper has skyrocketed in recent years due to it value in electrical wire. Some Kasar have had to leave the metal working profession and find new employment in agriculture and manufacturing. Literacy is an issue among the Kasar. Only about 70% of the Kasar population can read and write. The Bangladeshi government is working to raise those numbers among all her people. The Kasar practice Hinduism influenced by folk religion. They worship and serve the gods of the Hindu pantheon. Kali, the goddess of sexuality and death, is their patron deity. They also worship Vishnu and his avatars Rama and Krishna. Hindus believe that by performing rituals and good works that they will attain moksha or freedom from the endless cycle of birth, death and rebirth. The Kasar visit Hindu temples and offer prayers, food, flowers and incense to their gods. There are many forms of Hinduism, each with its own deities and beliefs. The main yearly holidays of the Kasar people are Holi, the festival of colors, Diwali, the festival of lights, Navratri, the celebration of autumn, and Rama Navami, Rama's birthday. The Kasar of Sri Lanka need to hear the life-changing message of Jesus Christ in a way they can understand. They need help in educating their children and learning new jobs skills as their ancient profession is vanishing. The Kasar need to see the love and mercy of Christ lived out among them in practical ways. * Pray the Lord will open the hearts of the Kasar people in Bangladesh to desire God's blessings through a movement of family-based discovery Bible studies. * Pray that strong movements to Jesus will bring whole Kasar families into rich experiences of God's blessings. * Pray that God will overthrow spiritual forces of darkness opposing the spread of His Gospel among the Kasar people. http://twashtakasartambat.blogspot.com/View Kasar (Hindu traditions) in all countries.